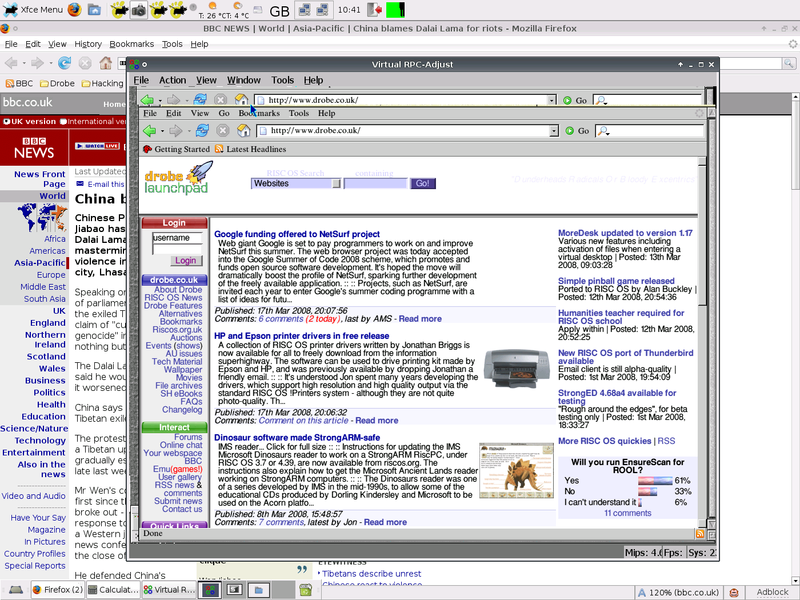 This is the remarkable screenshot of VirtualRiscPC running on a Linux desktop - a sight longed for by many open sauce types who wish to use the emulator on their computers. Theo Markettos was able to get VRPC running on his Ubuntu GNU/Linux system with the help of Wine, a nifty piece of kit that tricks Windows applications into thinking they are running on Microsoft's operating system when really they are on top of Linux or some other Unix. Published by VirtualAcorn, the commercially priced VirtualRiscPC is only available publicly for computers running Windows and Mac OS X, although Linux builds have been distributed exclusively to select beta testers. However, Theo has been able to prove that anyone can run the software on Linux, bringing RISC OS Adjust to the penguin realm. His screenshot here shows the RISC OS Firefox port running on a ROS desktop while the game Twin World can be seen running here. Theo said: "There are a few bits of display corruption where Wine doesn't draw the top and bottom of the window correctly but they don't affect RISC OS usage too much. Audio kind of works, but is a bit distorted." For the gory details on how he got it to work, and some crude comparisons between VRPC and the free emulator RPCEmu on Linux, see the link below. It gets a bit tiresome hearing these 'RISC OS is rubbish, Linux is perfect' comments. Of course Linux has all sorts of things that RISC OS lacks. But, whether or not you think they're mad, there are some people who would like to run RISC OS on their Linux boxes, and Theo's exercise will be of considerable interest to some of them. In reply to mripley Yes - it's an academic exercise of no practical day-to-day use as it stands. Yes - that's fine. It's fun to explore what is possible and I marvel at the inginuity of people who do so. Maybe something will come of it, maybe not. Personally, I greatly enjoy being a part of the crazy world that is RISC OS. Glad you are enjoying Linux. Regards, Martin. 2. paying the going rate for a MacBook. I'm impressed and intend looking into it further. Okay yeah I have to agree with you Linux is good, especially PCLOS, nice to know you like it too, but this is a RISC OS portal/on-line magazine website. If you want to spread doom and gloom about RISC OS, go ahead, but don't do it here, it just causes unneeded arguments and splits in the community, e.g. look at various projects in the Linux world. I my self use Ubuntu now and again, and enjoy the amount of free software, the flexibility, and expandability of it, but I go and discus it with my Linux using friends, or my user group, maybe sometimes on on-line forums, and keep it separate from my RISC OS world involvement. Guestx: the RISC OS user appeal is not just down to the software: the interface also provides 'a user experience that no-one has managed to reproduce on other platforms', which is why people like me struggle on with it despite its many shortcomings compared to both Linux and Windows. The solution is not necessarily going to lie in making one's data portable to Linux or other platforms (which it already mostly is, given the number of RISC OS applications capable of saving files as jpegs, pdfs, csv files or Word documents), or in porting apps to other platforms, because the user's experience will be different. Ovation Pro for instance is not the same experience on Windows as on RISC OS, I find. So if someone wants to spend time and energy making RISC OS run well on top of Linux, good luck to them I say. But why can't you just choose what works for you on each platform? Especially with Virtualisation - on my Mac I have OS X, Windows XP, Ubuntu and VirtualAcorn, all sharing files. I'd sruggle if I limited myself to any one platform and there is no need. While I respect your right to express and opinion I can't help but disagree with the stance you've taken. Yes, there are many problems with RISC OS, some of which have dragged on far longer than they should have. But you don't solve problems by giving up and walking away. Everyone one of us can do something to help- no matter how small it may be, and I'm not just talking about throwing money at the problem. For example: *If you have programming skills get involved in the ROOL imitative *Volunteer for beta testing software *offer constructive criticism when software doesn't work as expected or required (key word: constructive) *Support RISC OS Connect- you might not be able to programme but what about writing user manuals or support documents *If you have web design skills volunteer to maintain one of the many websites around. Ok I know a lot of responses to the above will be "I don't have time/skills/money to contribute" but every little helps. Theo Markettos found a solution that worked for him- allowing him to make the best of both the RISC OS and Linux worlds. This is something that should be applauded- even if you can't see a personal use for it. I have to agree with mripley. For me the realisation came a lot earlier, back when at Acorn World Acorn were showing Risc PCs running NetBSD as the future. At that time I wondered why they didn't port the RISC OS desktop to sit on top of NetBSD (a very similar strategy to what Apple ended up doing) on the basis RISC OS really internally is a complete mess, and simply not suited for modern systems. No programmer used to development environments on Windows/Mac/UNIX (even embedded ARM stuff) would tolerate the RISC OS setup for writing native apps - it's actually pretty dreadful. The filesystem, command interface, scripting, debugging, memory management, mode of multitasking, state of libraries etc. all conspire against you. Compare to the ARM based Gumstix, and I'd rather write for the Gumstix. I would dearly love to see the RISC OS desktop on a unix style backend (and frankly Acorn should have done this by 1998, presumably the inertia in the lower end of the education market combined with emulation for existing RO apps was the killer), but projects like ROX already deviate too far from the initial design, and this is at least partly because modern expectations are different. Using a three button mouse is unusual, as people expect the wheel, and now with the move towards touch based UIs it makes it look like RISC OS style interaction is a bit of a relic. Developing apps for RISC OS now is a nearly pointless endeavour, and any efforts would be better spent trying to recreate the UI on another platform, and running from there. The key problem is having the guts to admit that any app for your recreated desktop is going to have to require significant reengineering to integrate properly. My work PC still makes me swear many times a day for not managing to do things my Archimedes could do in 1992. I must concur with nige. Internally, RISC OS is utterly outdated. From what I understand, RISCOS Ltd have spent years of subscription money to abstract RISC OS away from its underpinnings, making it more portable and better suited for future hardware. A complete waste of effort, as some of us realise now. How does RISC OS 6 help solve the fundamental problems? It doesn't, it merely defers them. Just look at what happened to the other OS's dating back to the same days. Some died quietly, others are still a mess, like RISC OS. Apart from BSD and a few other obscure systems, there are only two real survivors from the golden days; obviously Windows and... Mac OS, although the latter had to be completely re-invented. Which is paying off big-time for Apple. That is what should happen to RISC OS, if it wants to move on. From what I understand, Acorn intended RISC OS to be a placeholder until they came up with something better. They made some serious attempts, like RISC iX and ARX. Unfortunately, RISC OS stayed. Now, they certainly got the GUI right from the start, but underneath that it's basically a mess. In the 90's, we could live with that. Certainly when compared to stuff like the Windows 9x family, but those days are long gone. Now, this is seriously holding back any future for RISC OS. So before we can move on, this needs to change. I know what some of you are thinking. It works for me, it still runs my favourite apps just fine and it only needs certain bits of software. Like a proper media player, fully-featured browser and all that. Now, wonder why that isn't here. It's not because people didn't try. Nowadays people are running RISC OS in a virtual machine on Windows and Mac OS X. They occasionally buy some new software, pledge some money or so. Try to help out in all manner of small ways. But the fundamental problems remain. And there we are. The most practical solution has been suggested several times now. Recreate whilst improving the RISC OS GUI on top of a Unix or Linux back-end. There even are a few projects underway trying just that! I believe the RISC OS we all know and love is basically brain-dead, but still breathing. It can be reworked here and there, as ROL have been doing, but it'd remain a lost cause. Therefore, it needs to be remade. The way I see it, it's the only chance left. There's a lot of free code out there just waiting to be used, like NetSurf did. Fundamentally, most users are more interested in what it does, what software it has and how fast it is as Windows has shown time and time again. If you want a RISC OS style experience built ontop of Unix, go and support ROX. If you want RISCOS to continue to evolve, support the efforts of RISCOS ltd or ROOL. If you want an OS written from scratch look at BEOS/Haiku. If you want to switch to something else, switch. Realistically, RISCOS is never going to see a total rewrite which would break all the applications (the main reason a lot of people still use it). Far more important (IMHO) is making the architecture more portable so it can run on new, more powerful ARM devices which have the power for handling streaming audio and so forth. You are right that apps are a large part of the reason people still use it, but your comment about outdatedness betrays a lack of understanding. (This is at least partly because BSD may have originated in the 70s, but it's rate of change was and remains immense). There are two key problems in RISC OS which to solve them would require modifications to the apps as well as the OS - memory and the multitasking. The way this works on RO is seriously out of touch with modern computing practise, and this is why porting apps back from the open source world happens so little in practise (not to mention the inadequacies of the filesystem, combined with the assumptions of many outside the RO world). This is made worse by the lack of floating point and OpenGL support. Additionally the ARM of today is radically different to the ARM of Acorn's era, to the point if you deal in machine code you have to change it quite regularly. They simply aren't binary compatible, and this is partly because modern ARMs are almost always sharing silicon with other components, generally to support phone or networking and multimedia, and partly because ARM change it. You aren't going to get RO running on these in a hurry, if ever, without emulation. If you recall the incompatibility when the StrongARM came in, think like that, only 400x worse. The sad thing is a lot of what made the apps good isn't present in modern computing. Acorn had a standard vector and bitmap format from the beginning, the great filer (and the way save boxes work) and a simply brilliant way of moving the windows around. (Computer Concepts added a lot to the software subsystems as well, like the embedded draw file mechanism, which made DTP a breeze). No modern system seems close to it in these areas, at least partly because you face rewriting apps UI to do it, which is the ROX problem. The temptation to simply use whatever new app they've come across overrides the design principles. markee174: RISC OS's internal design resembles OSes from the 60s more than it does modern systems. And anyway, who cares how old an architecture is? If they got it right 30 years ago, why replace it? Also, if you used a UNIX from the 70s, you'd notice significant differences from modern POSIX. Like only being able to run one process per user at a time. But even that's better than what RISC OS can do. RISC OS emulation on top of Windows on a high-spec PC seems to deliver speed and ease of use which is broadly comparable to the fastest native systems (some would say faster, based on actual tests): is there any reason why RISC OS emulation on top of Linux should not work at least as well, if not better/faster? "but your comment about outdatedness betrays a lack of understanding." We can have a long technical argument about this but its really going to boil down to semantics. Things like a Mach kernel, support for openGL and Posix compliance are definite advances but at its heart it would still be an evolution of the original PDP OS. Even if you are Microsoft or Intel, attempts to break with the past totally and create something all new have never been a success. markee174: "Whereas MAC OS and LINUX are still essentially built ontop of a 1970s architecture...."
"Fundamentally, most users are more interested in what it does, what software it has and how fast it is as Windows has shown time and time again." Exactly. That's why there are so many RISC OS users around. The trouble is, what it can do is severely limited by its architecture, especially true nowadays. Windows has shown nothing, whereas Microsoft has shown to be brilliant at manipulating ignorant sheeple, getting into trouble for it and managing to repeat that cycle. I know some people that know some people who don't like computers. They don't like them, because they don't like PC's. They don't like PC's, because they don't like Windows. They don't like Windows, because they don't like to feel like an idiot. "If you want a RISC OS style experience built ontop of Unix, go and support ROX. If you want RISCOS to continue to evolve, support the efforts of RISCOS Ltd or ROOL. If you want an OS written from scratch look at BEOS/Haiku. If you want to switch to something else, switch." What a cheap shot. So because I care for the future of RISC OS, I should go out and support something resembling it? Why do you think these project were created in the first place? One hint; it's not because the developers involved believed RISC OS could evolve to meet their goals. Why was Haiku written? Not only to recreate BeOS, but also to improve on its original design by avoiding some of the same limitations. "Realistically, RISCOS is never going to see a total rewrite which would break all the applications (the main reason a lot of people still use it). Far more important (IMHO) is making the architecture more portable so it can run on new, more powerful ARM devices which have the power for handling streaming audio and so forth." Not totally rewriting RISC OS itself, merely recreating its GUI to work on top of a Unix-like back-end. Quite the difference. Obviously this will break compatibility with applications, but that's always been the case beginning with Arthur on ARM2 and up until RISC OS 6 on ARM9. A realistic solution is to embed a virtual machine into the new OS. This means running existing apps transparently inside a virtual RiscPC machine, which blends brilliantly with the new RISC iX (for lack of a better name). For a feel of how this could work, take a look at the Classic Environment in Mac OS X. You might like to consider the possibility that ARM won't be particularly suitable for desktop class computers in the future. Have you seen what Intel has been doing? I'm sorry to say, but I'm afraid ARM seems more and more to be a dead-end for (the future of) RISC OS. "We can have a long technical argument about this but its really going to boil down to semantics. Things like a Mach kernel, support for openGL and Posix compliance are definite advances but at its heart it would still be an evolution of the original PDP OS. Even if you are Microsoft or Intel, attempts to break with the past totally and create something all new have never been a success." There is no need for a long technical argument, because the facts are clear for those not closing their eyes to them. If you choose to continue this debate, you will only see what we've seen until now. What do you think Windows NT was about and Microsoft are considering for Windows 7? Where do you think Intel is moving to? Is Mac OS X not a success? It all depends, but it never can be a success if the possibility is condemned before even attempted. Perhaps the obstructions involved are not of a technical or even practical nature. "There is no need for a long technical argument, because the facts are clear for those not closing their eyes to them. If you choose to continue this debate, you will only see what we've seen until now. " Thats the real problem with RISCOS and most of the discussions on drobe as a whole. Of course you're absolutely right so there no point carrying on. Mripley: "So Colin before you criticise my past involvement you should check what it was first!" My comment was not meant to be seen as a criticism of your past involvement, and if you read it as such then I am truly sorry. Yes I can see your point- there are probably many people in a similar situation who have spent just as many years supporting the RISC OS market as best they can. However my point remains- this development, even if its of no personal use, is something that should be applauded. "You might like to consider the possibility that ARM won't be particularly suitable for desktop class computers in the future." I nominate this as the understatement of the decade. From both the user's and the developer's point of view the serious lack of speed (CPU, memory, I/O) is the most serious problem RISC OS faces since 15 years. While many of the comments above focus on the (lack of) architecture of RISC OS, it is not the biggest problem. Not by far. The world's best OS architecture running on an IYONIX would not be able to satisfy today's users needs when it comes to e.g. multimedia and browsing experience. I would argue that today, no other cpu architecture than x86 can satisfy the user's desire for high performance and low price. And no other OS than Windows has the universal support for all those proprietory things - hardware drivers, codecs etc. The often mentioned "one true way into the future" of implementing RISC OS' GUI with Linux as a base would solve only very few problems. So IMHO the only long-term chance for RISC OS to survive is to use Windows as an abstraction layer. VRPC and RPCemu are the first logical step in that direction, and the ROOL project is essential for this. hubersn: "I would argue that today, no other cpu architecture than x86 can satisfy the user's desire for high performance and low price. And no other OS than Windows has the universal support for all those proprietary things - hardware drivers, codecs etc. The often mentioned "one true way into the future" of implementing RISC OS' GUI with Linux as a base would solve only very few problems. " Well, at least that "one true way into the future" solves the problem of not running on x86, and provides much better support for drivers and codecs than ARM-based RO ever will. I understand your point about Windows being the only OS that supports all hardware, but why do you think KDE and Gnome don't take the same approach you are recommending but run on Linux instead? There´s an attraction to freedom for many developers, and as long as there are alternatives to hardware that´s not supported by Linux, it´s not really a show-stopper that some things aren´t. That said, what do you mean when you talk about "the survival of RISC OS"? It could mean the survival of the companies RISCOS Ltd. and/or Castle, or the companies that exist to sell for the RISC OS market; or it could mean the look and feel or the original ARM code, the SWI interface, the community of users, the applications developed over the last 20 years, or something else. Which of these are really worth saving, and which aren´t? I think the answer is different for different people (I imagine there are some company directors who won´t like my opinion, for example), but without spelling it out, it´s hard to find a consensus. hubersn>Much as I hate to agree on this Windows has actually won. There are sufficient "lock-ins" to ensure that the only choice people now have to run the maximum number of applications is Windows. Likewise the "hardware" lock-in to x86 equally removes peoples choice of platform. Hopping from arguably an OS in decline (RISC OS) to one that is a Microsoft target like Linux is silly, IMHO. If you're going to abandon RISC OS go to windows - you'll probably wind up there anyway once the difficiencies of Linux become apparent (that's not to say that Linux is a bad OS but simply that too many content providers and hardware providers supporting Windows and that always means - at best - Linux is playing catch-up more often it can't compete). Besides even in this example - VARPC was run on a machine that was dual boot (i.e., it contained a full licensed copy of Windows anyway) do you think Mr Gates & Ballmer care if you *actually* use Windows at all or just that a license fee was paid - nope I didn't think so either. Why can there not be a version /munged windows version to run on Linux...Why force us to use Windows and MAC OS? I am sure there are many different OSs out there that people use who also would like to use RISC OS! Here is a mad thought, why not make a RISC OS Video player to get windows to do all the hard work....ie play videos using by drawing a green? area on the screen and telling the Windows to play a video in the green boundary? AMS: wtf are you talking about "hardware lock-in" ? You're free to choose what CPU you'd like to use. Just because x86 is the cheapest and fastest doesn't mean you're "locked in" - people don't choose it because they have to, they choose it because it makes sense to choose it, or they don't care. You can of course still buy desktop machines using ARM, MIPS, PPC and SPARC. Although these all have specialist niche purposes. Nothing underhand has happened here - it's just that the most cost-effective product won. Which isn't surprising. mripley: yes, the mobile and low energy demands are indeed changing. But IMHO this will not result in ARMs catching up with x86 speed, but in x86 variants catching up with ARMs wrt. low energy demands. See Intel's new Atom. IMHO, ARM's better architecture won't be able to compensate the much better fabrication technology Intel (and AMD) is able to throw at the problem. I don't see Linux succeeding in any major way in the market where RISC OS once was a viable solution (desktop). It is surely usable if you want to arbitrarily limit what you want to do - reminds me of RISC OS. And I can't see Microsoft losing market share in any meaningful way. Don't get me wrong, there are a lot of niches where Linux is great, and I have multiple boxes running Linux at home (dBox2, Freecom NAS/Router, Ubuntu box for CVS, Codebeamer and Tomcat, VDR box). But I don't use them at all for the things I use RISC OS and Windows. In my mind, Linux and Windows are orthogonal, and most users' profile matches a lot better with Windows. Apple is a whole different story. They sell mediocre products at premium prices because they are perceived as "cool" and "premium". I don't think we should try and repeat that. Concerning WINE, I have followed its development for many years now, and I don't agree that it is "improving" and "catching up" with the state of Windows. In fact, compared to around 1999, the gap is widening. So what does this mean for RISC OS? We have to "free" it from the ARM platform. The only meaningful way to do this is to use emulation - the apps we all use and love won't get rewritten, and it would be silly to try. The same goes for large parts of RISC OS. What we need is a powerful "Acorn-style hardware" emulator (partly already available - VRPC and RPCemu) and a lot of extensions that allow usage of parts of the host system (partly already available - see HostFS and networking in VRPC and RPCemu, the ATAPI extensions for VRPC). In other words: the ARM code will act like Java's bytecode, and the host OS will act as the hardware abstraction layer. The opinions I hold of the virtues of Windows, Linux, MacOS or different processors are not really important, because the concept just works everywhere.